Science-based sustainable management of agroforestry and silvopastoral systems is essential for their maintenance in a changing world. Using bibliometric and network analyses, we characterized how research is addressing the ecological and socio-economic dimensions of sustainable management of cork oak (Quercus suber) silvo pastoral systems, Mediterranean ecosystems of high nature conservation and socio-economic value. We retrieved publications on cork oak from the Web of Science. More than 60 countries contributed with research on this system. Retrieved papers addressed a great diversity of topics and were published in a variety of journals, highlighting the multidisciplinary character of cork oak research. Research grew exponentially after the 1990’s, possibly stimulated by the establishment of the European Forest Ecosystem Research Network. Our analysis shows that most research priorities identified for the Mediterranean region are being well addressed in cork oak systems, although research on the interactions between ecological and socio-economic components remains underrepresented. Less research has been published in North Africa compared to Europe, which is worrisome because it hosts a large area of cork oak that faces major sustainability challenges, often different from those prevailing in Europe. Our study shows that, despite constraints, the global scientific community is contributing to fill relevant knowledge gaps on the sustainability of cork oak systems across their range. 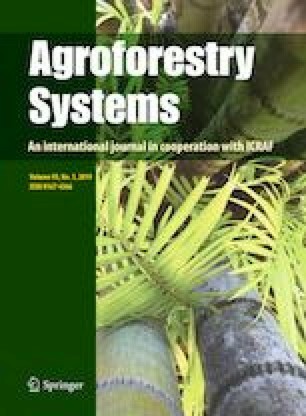 Bibliographic and network analyses proved effective to uncover patterns, gaps, and potential constraints on cork oak scientific research and can be easily used to analyze research in other agroforestry and silvopastoral systems worldwide. The online version of this article ( https://doi.org/10.1007/s10457-018-0231-9) contains supplementary material, which is available to authorized users. AIL and RAC were supported by Fundação para a Ciência e a Tecnologia (FCT) through grants SFRH/BPD/88056/2012 and SFRH/BPD/118635/2016. MNB is supported by FCT Principal Investigator contract IF01171/2014.